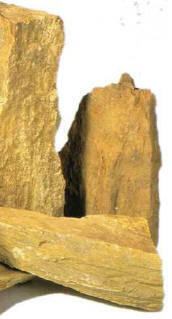 Rocks suitable for use as decorative elements in an aquarium can be found in natural settings or in specialist stores. Make sure they have no excessively sharp splinters: sand them down to ensure that the fish do not get injured when in contact with them. 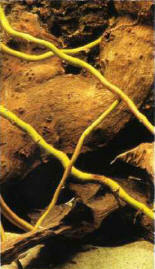 Decor based on plant material: peat-bog roots and willow branches. How can you recognize a calcareous rock? By repeating a tried and tested experiment that some of us performed in school: pour a few drops of vinegar or acid onto the rock. If a slight effervescence does occur, which is caused by the release of carbon dioxide, this means that the rock contains calcium. The same method can also be used to test sand. 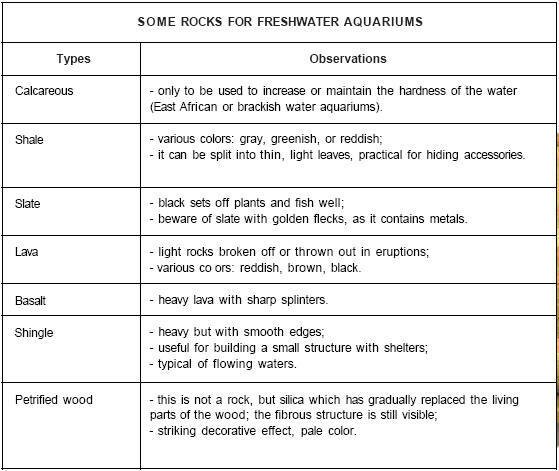 Rocks can be taken from natural settings, but they are also available in the aquarium trade. The natural environments of our fish often contain more vegetation than rocks: roots, branches that have fallen into the water, bark, and plants that become submerged in the rainy season. When used alone or with a rock, wood creates a beautiful decorative effect, especially if it also plays host to moss or ferns. 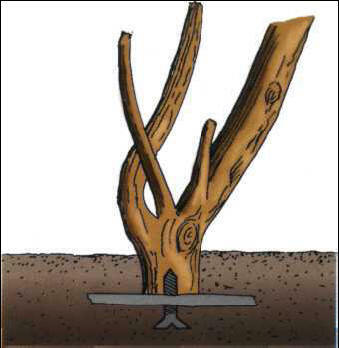 Wood can be held in place by screwing it to a small stone base. It is therefore logical to use wood in an aquarium, but it must be treated first. Wooden materials have two major disadvantages. Firstly, they release acid substances that turn the water a yellowish amber color. Although this is no problem for Amazonian aquariums, this is not really the case in waters that have to be kept hard. Secondly, wood is light and must be wedged or weighed down. free it of most of its acid substances and colorings. or copper sulfate, at 1 g/liter. Then boil the wood, replacing the water several times. If the latter is colored, this is proof that the acids are leaving the wood. Ideally, the treatment should be concluded by keeping the wood submerged for 1 or 2 weeks, so that it gradually fills up with water. 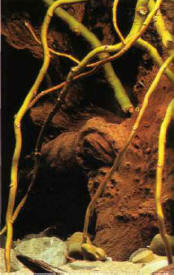 This is, however, often insufficient: the wood may still float and have to be wedged into the aquarium with a few rocks. You can otherwise also weigh it down with small stones attached by a nylon line that is all but invisible in the water, hiding this part of the wood in the sediment or else among other rocks on the bottom. ЩЕЛКУНЫ , семейство жуков. Длина обычно 7-20 (иногда до 50) мм. Ок. 10 тыс. видов, в Евразии и Америке; в России несколько сот видов, почти повсеместно. Личинки (проволочники) повреждают корни многих растений.